For other uses, see Principality of Serbia (disambiguation). "Востани Сербије" / "Vostani Serbije"
The Principality of Serbia (Serbian: Кнежевина Србија / Kneževina Srbija) was a semi-independent state in the Balkans that came into existence as a result of the Serbian Revolution, which lasted between 1804 and 1817. Its creation was negotiated first through an unwritten agreement between Miloš Obrenović, leader of the Second Serbian Uprising and Ottoman official Marashli Pasha. It was followed by the series of legal documents published by the Porte in 1828, 1829 and finally, 1830 — the Hatt-i Sharif. Its de facto independence ensued in 1867, following the expulsion of all Ottoman troops from the country; its independence was recognized internationally in 1878 by the Treaty of Berlin. In 1882 the country was elevated to the status of kingdom. The Serbian revolutionary leaders — first Karađorđe and then Miloš Obrenović — succeeded in their goal of liberating Serbia from centuries-long Turkish rule. Turkish authorities acknowledged the state in 1830 by the charter known as the Hatt-i Sharif, and Miloš Obrenović became a hereditary prince (knjaz) of the Serbian Principality. At first, the principality included only the territory of the former Pashaluk of Belgrade, but in 1831–33 it expanded to the east, south, and west. 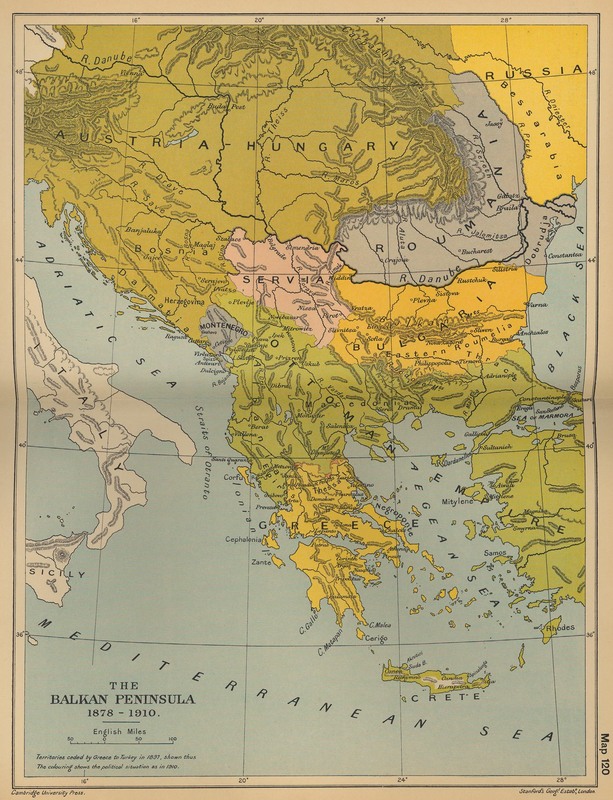 In 1866 Serbia began campaign of forging The First Balkan Alliance by signing the series of agreements with other Balkan entities in period 1866-68. On 18 April 1867 the Ottoman government ordered the Ottoman garrison, which had been since 1826 the last representation of Ottoman suzerainty in Serbia, withdrawn from the Belgrade fortress. The only stipulation was that the Ottoman flag continue to fly over the fortress alongside the Serbian one. Serbia's de facto independence dates from this event. A new constitution in 1869 defined Serbia as an independent state. 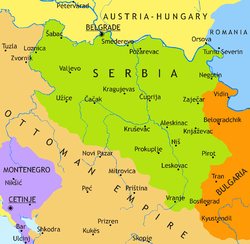 Serbia was further expanded to the southeast in 1878, when its independence from the Ottoman Empire won full international recognition at the Treaty of Berlin. The Principality would last until 1882 when it was raised to the level of the Kingdom of Serbia. Akkerman Convention (7 October 1826), treaty between the Russian Empire and Ottoman Empire, had article 5 on Serbia: autonomy, and return of lands removed in 1813, Serbs were also granted freedom of movement through the Ottoman Empire. Rejected by Mahmud II in 1828. This is ethnic and religious composition of Principality of Serbia in 1866 and after that population by year (with bolded text being dominant). The Principality was ruled by the Obrenović dynasty, except for a period under Prince Aleksandar of the Karađorđević dynasty. Princes Miloš and Mihailo Obrenović each reigned twice. ^ Michael R. Palairet (2002). The Balkan Economies C.1800-1914: Evolution Without Development. Cambridge University Press. pp. 16–. ISBN 978-0-521-52256-4. Divac, Zorica. "Family and marital affairs in 19th century Serbia." Glasnik Etnografskog instituta SANU 54 (2006): 219-232. Radovan Samardžić (1982). Greek-Serbian Cooperation, 1830-1908: Collection of Reports from the Second Greek-Serbian Symposium, 1980. Serbian Academy of Science and Arts, Institute for Balkan Studies. Temperley, Harold W. V. (1919). History of Serbia (PDF). London: Bell and Sons. Milićević, Milan (1876). Кнежевина Србија: географија, орографија, хидрографија, топографија, аркеологија, историја, етнографија, статистика, просвета, култура, управа. Jovan Ristić (1898). Diplomatska istorija Srbije za vreme srpskih ratova za oslobođenje i nezavisnost: Drugi rat 1875-1878. Slovo ljubve. Катић, Бојана Миљковић. Пољопривреда Кнежевине Србије:(1834-1867): Agriculture of the Principality of Sebia (1834-1867). Vol. 65. Istorijski institut, 2014. Mrđenović, Dušan, ed. (1988). "Устави и владе Кнежевине Србије". Устави и владе Кнежевине Србије, Краљевине Србије, Краљевине СХС и Краљевине Југославије (1835-1941). Belgrade: Nova knj. Nikolić, Dragan, Ristić, V., Arsić, L., & Kostov, V. (1991). Krivični zakonik Kneževine Srbije. Gradina. Николић, Драган. "Кривични законик Кнежевине Србије." Просвета, Ниш (1991). Јагодић, Милош. Насељавање Кнежевине Србије: 1861-1880: Settlement of the Princedom of Serbia: 1861-1880. Vol. 47. Istorijski institut, 2004. Katić, Bojana Miljković. "Сеоско професионално занатство Кнежевине Србије (1834-1866)." Историјски часопис 62 (2013): 309-329. Stranjaković, Dragoslav. Politička propaganda Srbije u jugoslovenskim pokrajinama: 1844-1858 godine. Štamparija Drag. Gregorića, 1936. Stranjaković, Dragoslav. Jugoslovenski nacionalni i državni program Kneževine Srbije iz 1844 god. Srpska manastirska štamparija, 1931. Stranjaković, Dragoslav., 1932. Srbija pijemont južnih slovena, 1842-1853. Nar. štamparija. Petrović, V., and N. Petrović. "Građa za istoriju Kneževine Srbije, vreme prve vlade kneza Miloša Obrenovića." Beograd, knjiga prva 1821 (1815). Nikolić, Dragan K. Izvori i priroda krivičnog prava Kneževine Srbije u vreme pripreme krivičnog zakona. 1988. Arsić, M. "Crkvene matične knjige u propisima Kneževine Srbije." Arhivski pregled 1.4 (2000): 52-5. Leovac, Danko Lj. Србија и Русија за време друге владавине кнеза Михаила:(1860-1868). Diss. Универзитет у Београду, Филозофски факултет, 2014. Slavenko Terzić; Slavko Gavrilović (1992). Srbija i Grčka: (1856-1903) : borba za Balkan. Istorijski institut. Недељко, В. "AUTONOMY OF THE ORTHODOX CHURCH IN THE PRINCIPALITY OF SERBIA AND THE ARONDATION OF THE EPISCOPACIES (1831-1836)." ISTRAŽIVANJA, Journal of Historical Researches 25 (2016): 233-248. Popović, Radomir J. "Пројект Устава Србије Матије Бана из 1846. године." Мешовита грађа 34 (2013): 149-171. Ђорђевић, Тихомир. "Насељавање Србије, за време прве владе кнеза Милоша Обреновића (1815-1839)." Гласник Српског географског друштва 5 (1921): 116-139. Маринковић, Мирјана, and Терзић Славенко. Турска Канцеларија Кнеза Милоша Обреновића, 1815-1839. Историјски институт САНУ, 1999. Кандић, Љубица. "Делатност скупштина за време прве владе Милоша Обреновића." Анали Правног факултета у Београду 1 (1961). Radoš Ljušić (1986). Кнежевина Србија (1830-1839). Srpska akademija nauka i umetnosti. Wikimedia Commons has media related to Principality of Serbia.